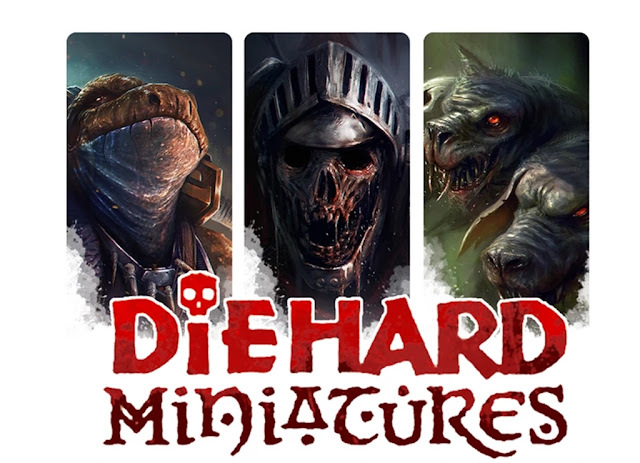 Diehard Minatures. A Kickstarter worthy of note. Since I was turned on to this by someone else,and since I'm a backer I would be remiss not to spread the word. Fans of old school citadel miniatures should rejoice as these figures pay homage to the classic Citadel figures from the 83-87 era. If you're a fan of Old School Warhammer or "Oldhammer" as they say these days or of course the classic Mordheim. then this is for you! There are options for just a solo figure all the way the whole thing for the so inclined. Now they arent the cheapest figures, being high quality pewter and akin to "hero" models not rank and file troops for large wargames. The sweet spot is the 30 quid pledge about (46 usd) which gets 5 figures plus a bonus figure from the pledge so that's about $7.50 a figure...which is, trust me!, a way better deal then you will normally find on ebay for comparable vintage figures of the era. Please give it a thought, I really want to see this hit the 10K mark so it unlocks that level of figures! The Adepticon Cart opened at 8pm cst this evening, just over 2 hours ago..and as usual things are already selling out, I was promptly on signing up for my events which as player is all Bolt Action for me both the Doubles and The Nationals, more on Bolt Action later as I get my act together to talk about my new force. I wanted to take time to mention my Thursday night activity which is the return of my Legends of the High Seas game, which last appeared in 2014. While you will see a very similar board to what you see here from last time around, I am expanding it a bit with a bit more play space and now 12 slots. The game is one part miniatures game, one part drinking game, and seems to to have last time included live gambling, bribery and extortion. needless to say its 21+ and over. Five tickets sold right off the bat so we've got seven more slots, please go over the rules about the miniature requirements before you commit , as it is a miniatures game after all. As for long out of print, rare and ebay expensive ruleset. Dont worry about that if you havent played before want to paint up a Pirate crew and get in on action , I'll be putting together a necessary rules PDF to give out as necessary long before the event. Drink up ya scallywags , yah better start practicing only 129 days!